U.N. Secretary-General Kofi Annan wishes the whole world could unite around diseases, poverty and human rights like it did around the 2006 World Cup. In a frank interview with Spiegel on wide-ranging subjects, U.N. Secretary-General Kofi Annan says he is “a bit envious of FIFA” because the whole world united around the soccer ball and paid attention to the World Cup. He wishes the whole world could unite and tackle diseases, poverty and humans rights and stop the genocide in Darfur. Iraq has been a huge lesson learned for the Americans, Mr. Annan notes. He predicts the U.S. Congress will be reluctant to approve a similar war so haphazardly in the future. Mr. Annan says he is a football referee but without the yellow and red cards. The secretary-general’s term expires at the end of this year when he will have served 44 years in the United Nations. He has been a tireless advocate for human rights and sustainable development, but his tenure has been marked by seismic changes in the world body. The U.N. has become even more theatrical since Nikita Khrushchev’s shoe-banging incident. It has become a stage for the likes of Mahmoud Ahmadinejad and Hugo Chavez to spew propaganda and hatred. It has become a helpless toy for the rich which gets to play only if they allow it. The world has changed, too. 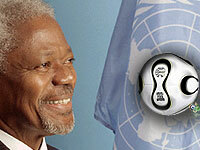 Germany will join the Security Council sooner or later, Mr. Annan tells Spiegel. But uniting 192 member states, who have a tough time agreeing on anything, is a challenge, he admits. This week, he is trying to correct a mistake that led to the hasty withdrawal of Israeli forces and to the vacuum filled by the Hezbollah militia. Mr. Annan is arguing for a bigger, stronger U.N. force to guard the southern borders until the Lebanese military is strong enough to secure its territory from Hezbollah. This new force, he hopes, would actually have the power to enforce a cease-fire and create stability. But who would give the U.N. such power to keep the peace?